"Ireland's experience on the Nice Treaty is a perfect example of autonomy and good democratic procedures in practice, something that the UK may want to learn from and imitate"
In Plato’s famous analogy of the Ship of State, the people are represented in a democracy by myopic ship-owners with insufficient and inadequate knowledge of seafaring, while politicians and demagogues are the quarrelling sailors. Thus far, this metaphor is a perfectly accurate picture of British politics today. According to Plato, the only hope for the Ship of State is for philosophers to take the helm and captain the ship. Theresa May is many things - certainly tenacious and unyielding, important qualities for any politician - but she is not a philosopher, nor will she ever be. It is not clear whether any Ship of State could navigate through the toxic quagmire that is Brexit. But as the United Kingdom drifts closer to the rocks of a "no deal" outcome with the European Union, a philosophical argument can be made for a viable route of a second referendum. This solution is not only politically feasible, but also a moral imperative. The mere suggestion that there is scope for a second referendum on Brexit has been met in some quarters with howls of incredulity, ridicule and outrage. The idea that the people should be summoned for a second vote within the space of two years is deemed a blatant affront to the nation’s democratic ethos, to try and tested democratic procedures, and an insult to the expressed will of the people. Brexit is Brexit, the argument goes. The people spoke on June 23rd 2016. There is no going back. For these reasons, ardent Brexiteers consider a second referendum to be morally unacceptable and politically dangerous. Each time this solution is proposed, near-apocalyptic scenarios of interminable conflict and violence are beckoned. Or so we are told. But there is another side to this story. Given the complexity of the issue and the impasse on the Withdrawal Agreement in Westminster, a second referendum is a political necessity. Furthermore, a second referendum is a moral requirement. 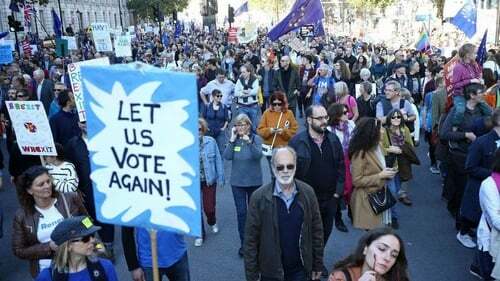 A second referendum would not mark the end of democracy in the UK as we know it, and the prospect of anarchic violence post-referendum is nothing more than empty rhetoric and shameless fear-mongering. We in Ireland know this better than anyone else in the EU having held two referendums on the Treaty of Nice. On June 7th 2001, voters narrowly rejected the Treaty of Nice (turnout 34 percent). 16 months later, there was a second referendum on a slightly amended Treaty. The result of the second referendum was a 60 percent Yes vote. This second referendum did not cause the collapse of democracy in Ireland, and there was no bloodshed as a result of it. All of which goes to show that it is possible, and desirable, to have more than one referendum on an issue. But apart from political expediency, there are also good moral reasons why a second referendum on Brexit should be held. Repeating a referendum is not necessarily contrary to the "will of the people", which in any case is an indeterminate, unhelpful and potentially dangerous concept. The relentless appeal to the "will of the people" by Brexiteers is nothing more than an opportunistic populist slogan. The sooner we dispense with this empty catchphrase the better, as political philosopher Albert Weale convincingly argues in his recently published book "The Will of the People: A Modern Myth". It was a mistake to hold the first Brexit referendum in 2016, but this may be one of those rare occasions in politics where two negatives make a positive. Given the complexity of the issue, to re-run the referendum on Brexit makes sense and it would be consistent with prevailing moral accounts of autonomy. Like any election, a referendum is an expression of individual and collective autonomy. The standard account of autonomy, as endorsed for example by the influential American philosopher John Rawls, says that there are three parts to an autonomous action. First, to formulate a conception of the good life. Second, to act upon and pursue one’s conception of the good life. Third, and perhaps most importantly, to revise one’s conception of the good life. In other words, having the aptitude, ability and opportunity to revise one's conception of the good life - or even simply changing one's mind - is a basic tenet of autonomy, and autonomy is a fundamental principle of modern democratic theory. That is precisely why elections are held at regular intervals in any liberal democracy and the voters are given the opportunity to change their minds from one election to the next. Where people are denied the right to revise their views and conceptions of the good, there is no democracy. On the question of whether there should be a second referendum on Brexit, the UK has something to learn from Ireland. Ireland’s experience on the Nice Treaty is a perfect example of autonomy and good democratic procedures in practice, something that the UK may want to learn from and imitate. But Brexiteers will not listen to reason. They are firm believers that British democracy is unique, immensely robust and unsinkable - which is exactly what they said about the Titanic. A second referendum could be the only viable solution.